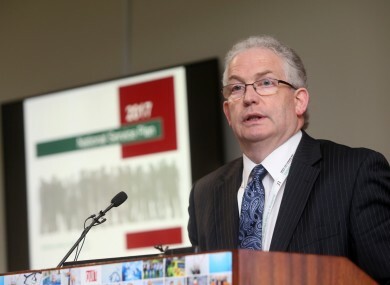 Director General of HSE Tony O Brien at the publication of the HSE 2017 National Service Plan. THE HSE HAS published its plan for 2017, saying it will spend €13.9 billion on day-to-day expenses. That level of funding is an overall increase of €458.6m (3.4%) when compared to 2016, but this includes just €36.5m to fund new service developments. Separately, a provision of €439m is available in capital funding in 2017, comprising €384m for building, equipping and furnishing of health facilities, with a further €55m for ICT. The plan projects that while there will be 24,000 fewer medical cards, there will be 50,000 more GP visit cards. HSE Director General Tony O’Brien said while launching the plan, there were “a number of risks”. These include increased demand and controlling staff numbers. While it promises a 5% reduction in waiting times, the Irish Medical Organisation (IMO) says it offers “no respite”. “When the HSE itself starts pre-warning about budget shortages before the Service Plan is produced, you know you are facing a problem. Justin Moran of Age Action said that the plan was “very disappointing” and said it ignores the crisis in home care supports. The National Association of General Practitioners (NAGP) said that the HSE’s commitment to make a decisive shift to GP-led primary care is not reflected in plan. They say this is reflected in a budget increase of €30.8m in primary care to an increase of €118.4m for acute hospitals. The plan has been published on a day when the INMO’s Trolleywatch counts 536 people on trolleys or waiting for admission to a bed. Email “The HSE will have €14 billion to spend next year - but that may not be enough”. Feedback on “The HSE will have €14 billion to spend next year - but that may not be enough”.